Building forms used to be time consuming and frustrating, but Form Builder makes it a simple pleasure. It will literally save you hours, and potentially days, of time. EASY. Building front-end forms on your website has never been so simple. 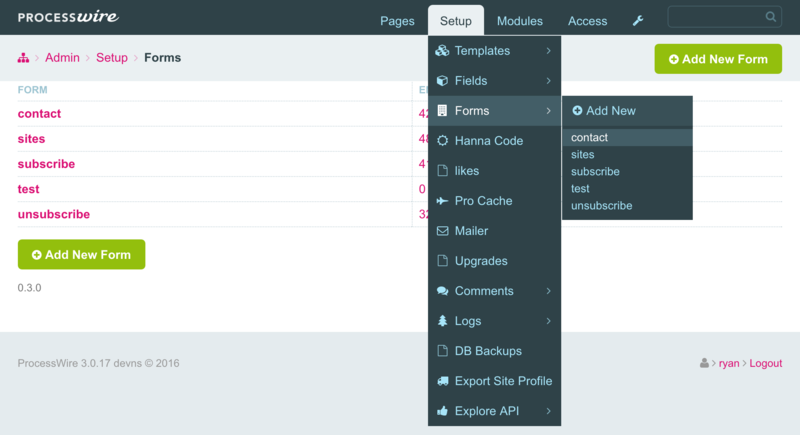 ProcessWire Form Builder lets you create, edit and publish forms with no development necessary. The goal was to create a system where you could discover a need for a form and have it running, and ready to take input, in as little as 5 minutes. POWERFUL. 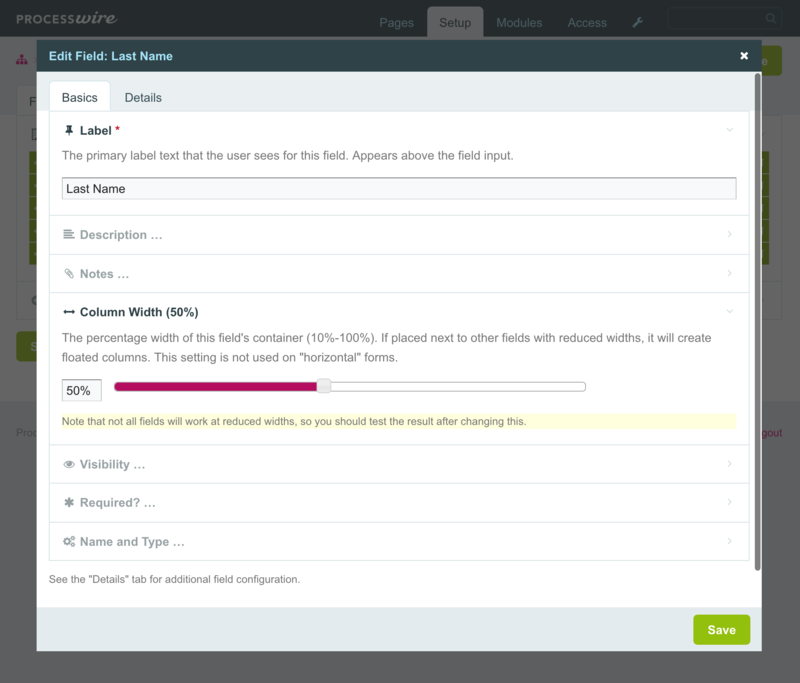 When it comes to long forms or complex needs, ProcessWire Form Builder has you covered. Advanced input capabilities like asmSelect, file and image fields, date pickers and variable width fields and fieldsets are easily accessible in Form Builder. Form Builder can also export spreadsheets of your form results, cross-post to 3rd party services, and embed forms in multiple ways. RISK FREE. 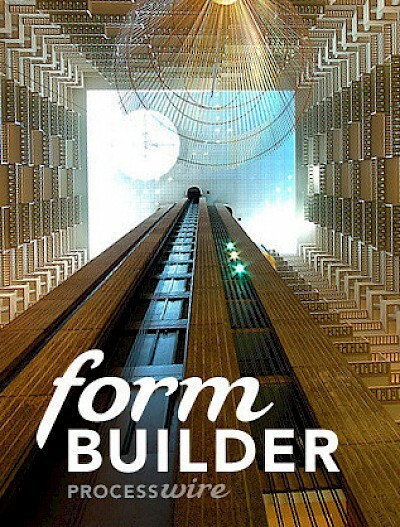 If you purchase Form Builder and don't love it, get a full refund. See the Form Builder satisfaction guarantee and return policy. Create unlimited forms with any number of fields. 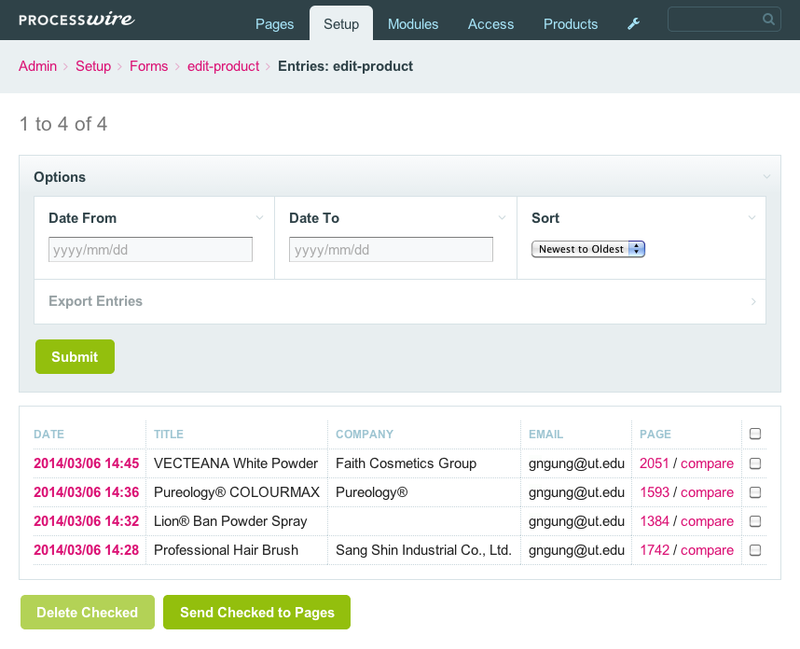 Create and publish forms with no programming necessary. 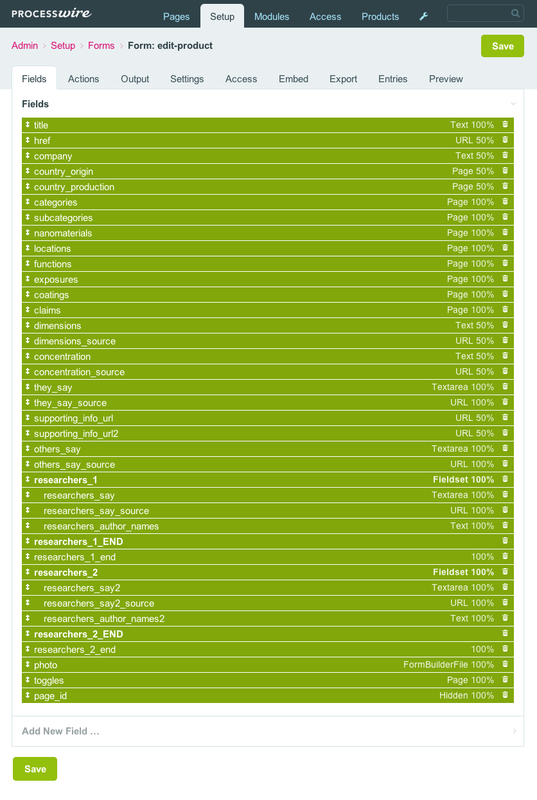 Saves entries to a database, email, ProcessWire page, 3rd party service, auto-responder, or any combination of these. Insert a form on any page in your site just by typing its name in the text. Access control for submitting forms, editing forms and viewing entries. Control over markup and output with frameworks including ProcessWire Basic, ProcessWire Admin, Bootstrap, Foundation, Uikit, plus the ability to add your own framework. In addition, you can add any number of additional input types by installing more input field plugins in your ProcessWire installation. Method B: Template embed method that lets you render the form by copying and pasting a single line of PHP into your template file. Method C: Custom embed method renders the form among your other site markup for more control over style and placement. Method D: Like embed method C but also gives you full control over all of the form markup. Export an entire form definition and import it somewhere else with a simple copy+paste. For example, you could create a form locally, then copy and paste the definition to your live website and have it up-and-running in under a minute. Export form entry results to a CSV file that can be read by your spreadsheet for more detailed analysis, or imported into any number of other tools (including ProcessWire's ImportPagesCSV module). Form submissions can also be exported to external services at the time they are submitted. Built-in output framework support for ProcessWire Basic, ProcessWire Admin, Bootstrap, Foundation and Uikit. Add your own framework, or output using your own custom markup! Comprehensive structured markup that can be adjusted to fit nearly any style. By default, forms are responsive and adapt to screen or container width. 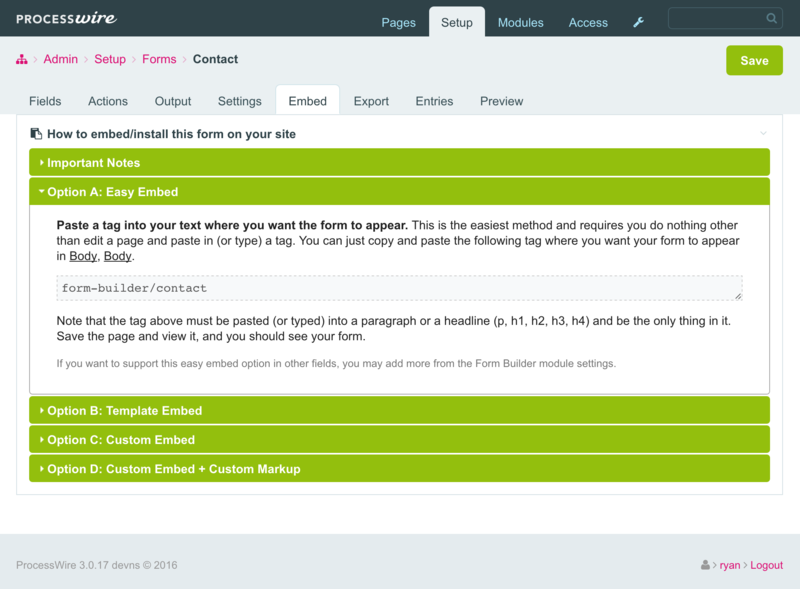 The latest Form Builder version requires ProcessWire 2.7.0 or newer. 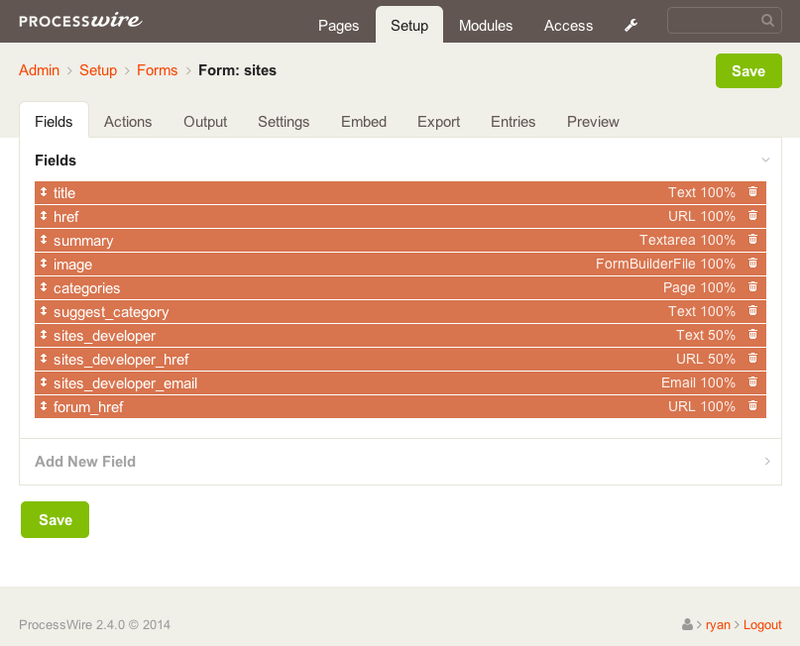 Like all the Pro modules, Form Builder also works beautifully with ProcessWire 3.x. We also maintain Form Builder versions for older version of ProcessWire. All versions are available to the purchaser. Single: may be used on 1 website. Professional: may be used on 3 different websites. Developer: may be used on as many new sites as you [an individual developer] create over the period of 1 year. Agency/firm: may be used on as many websites as your agency/firm creates for a period of 1 year. You may pay by VISA, Mastercard, American Express or PayPal through the ProcessWire store. Your transaction will be processed instantly and you'll receive a software download link and key. Your forum access will also be upgraded automatically. We want to make sure that you are happy with Form Builder. If you purchase a copy of Form Builder and find it doesn't meet your needs and you won't be able to use it, you may get a full refund within 7 days of your purchase. 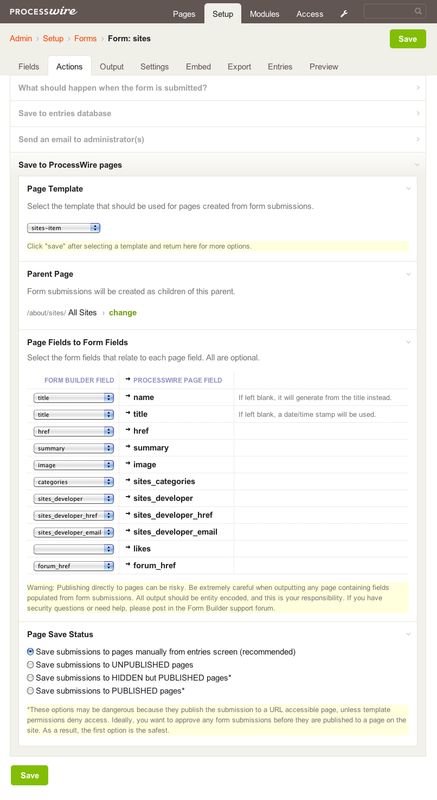 This Form Builder is developed by Ryan Cramer, lead developer of ProcessWire CMF/CMS. 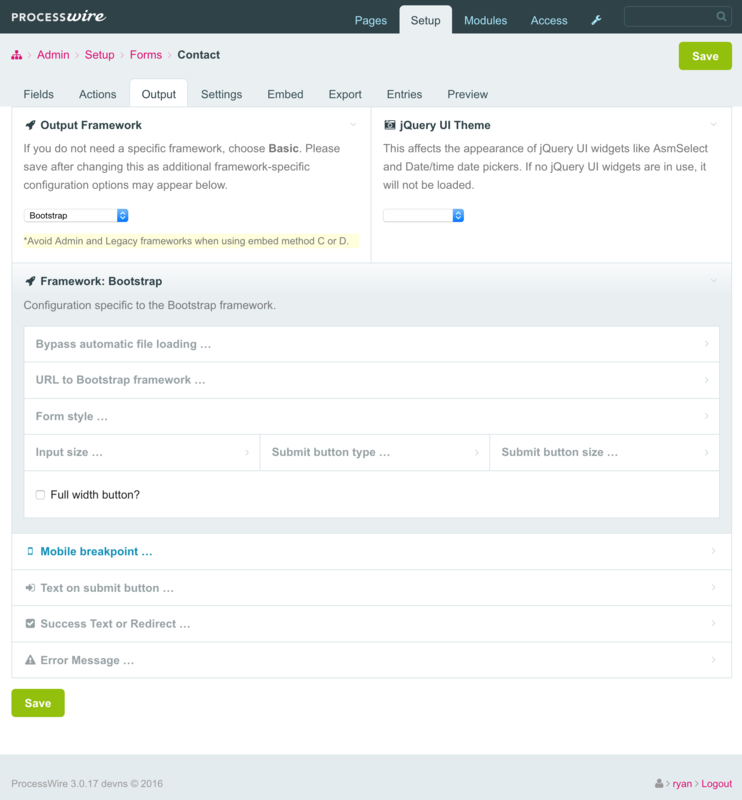 Form Builder was created to support the ProcessWire project as a whole, and I wanted to make sure that it was something really special. 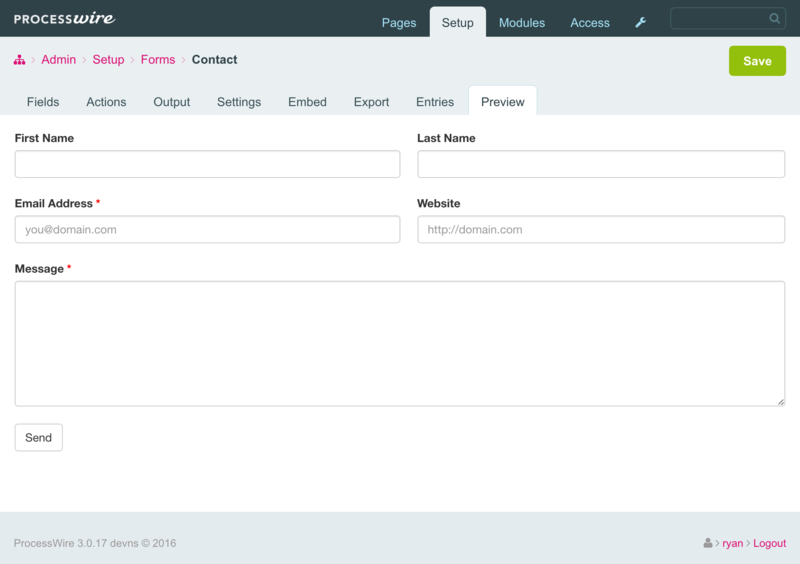 By purchasing and using the Form Builder, you are supporting development of not just Form Builder, but ProcessWire as well. Thank you for your interest in and support of ProcessWire. Should you have any questions about Form Builder, please visit the ProcessWire forum or send me a message from the ProcessWire contact form (powered by Form Builder of course!). 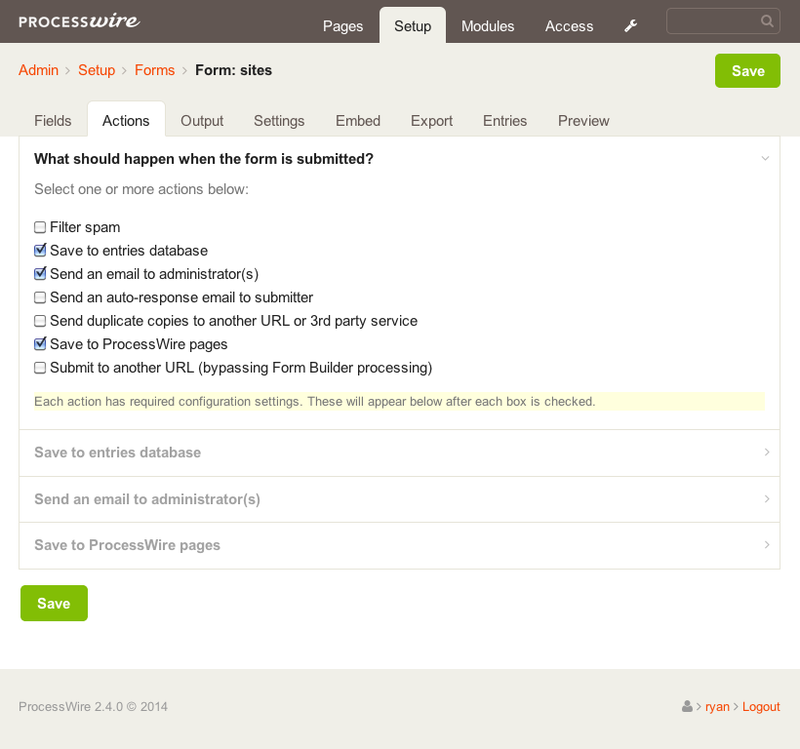 This form uses embed method A and the ProcessWire Admin (Reno style) output framework. This form uses embed method A and the ProcessWire Basic output framework.